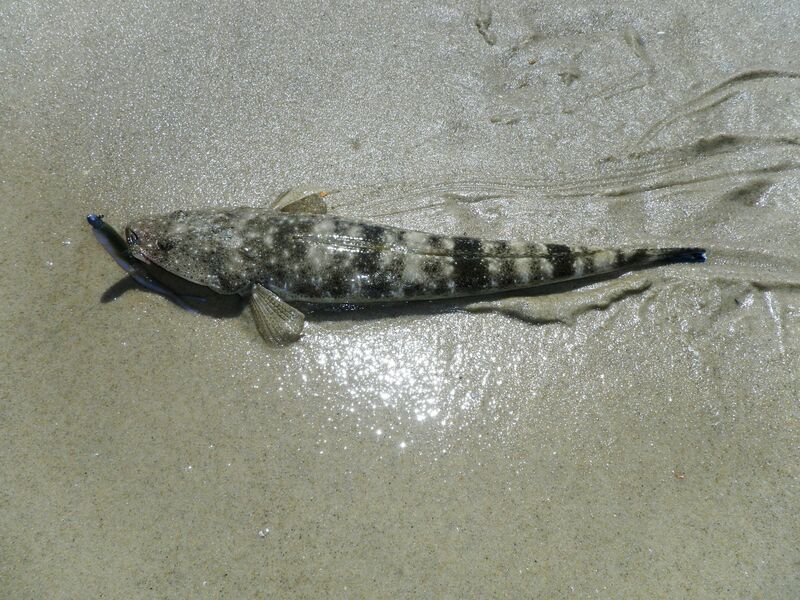 I got out amongst the Flathead at Bribie Island again on Tuesday morning. We are back to very early starts if you want to be fishing at first light. I was awake at 3.30 am and standing under the bridge on the mainland side at around 4.30 am, just as the sky began to light up. The water was dead calm and the tide was running in. It would be high at around 8.00am. There was no breeze but it was forecast to grow into a strong north-easterly by lunchtime. I could see bait everywhere, flickers of silver glinted under the bridge lights. Occasionally there was a splash on the surface, as a predator struck from below. I cast around with a GULP Crazylegs Jerkshad in the New Penny colour. I felt a few bites but nothing serious. The tide was coming in fairly quickly and the strong south easterlies of previous days had stirred up the weed again. As it grew light and the tide got higher a constant stream of floating sea grass made the fishing difficult. After a while I jagged a small Mullet. There were big schools of these cruising under the bridge. I decided to switch locations and drove across the bridge and down to Bongaree, on the island. The tide was really moving now and I could not fish over the ledge in front of Buckley’s Hole, so I gave up after a few minutes and switched locations again. This time I decided to try the flats at White Patch. I started at the second set of steps and waded south, casting my soft plastic at the edge of the rocks and sunken logs that were now semi-submerged by the rising tide. No luck – but I did see some big fish smash into the Mullet schools that were hovering off the ledge, further out. I could not see what they were. At first I thought Tuna, but I have rarely seen them this far up the Pumicestone Passage. The attacks were highlighted by the calmness of the water in between. After a big swirl sent Mullet flying in all directions I think I saw a good size Queenfish jump clean out of the water in pursuit. I have heard about them being caught here, but not seen them. Despite the show going on just out of casting distance, I was still without a fish. The weed carpet that had slowed me down earlier now arrived with the top of the tide. Sometimes you need to change the dynamic. I drove down to Scoopys Café and had a coffee, looking out over the Pumicestone Passage. At about 9.00 am I walked back along the beach in front of Buckley’s Hole and went back to basics. I tied on a 12lb fluorocarbon leader, loaded the natural looking GULP 4” Pearl Watermelon Minnow soft plastic on a 1/8th oz, 1/0 jighead . I then moved south along the beach casting into the shallow water, mindful that this was where the fish had been last week – right up close to the beach, in the shallows. The tide was running out and the weed had washed away again. After 10 minutes, a fish grabbed the soft plastic a couple of metres from the beach. It was a 45cm Flathead and after 5 hours of fishing I was happy to see it. I continued down the beach and turned around when I reached the no.1 beach flag. I waded out to about waist deep and started to walk back, to the north. I was casting up, into the out-going tide, aiming at an angle back towards the beach. I felt a good bite, but there was no hook up. 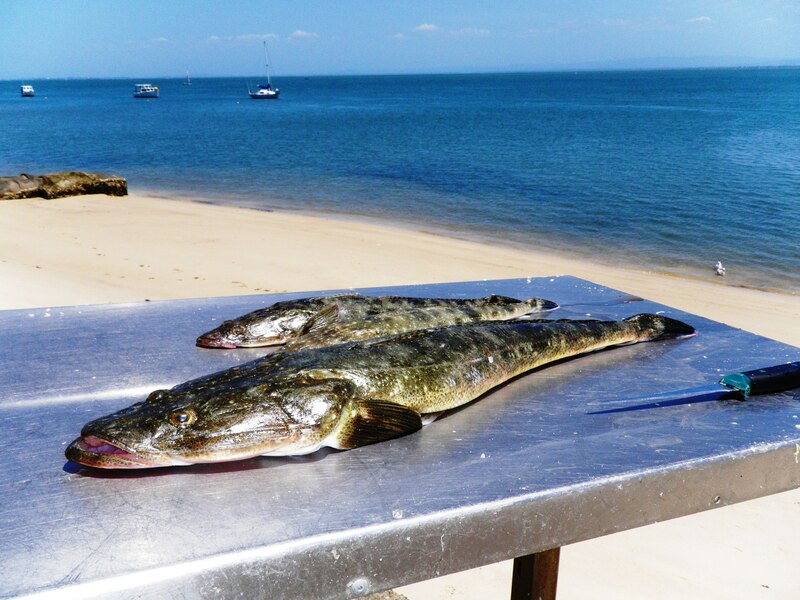 I carried on and was soon rewarded with another Flathead, a little smaller than the first – things were improving. All along this stretch of beach the wind and tide is starting to carve small bays in the sand. 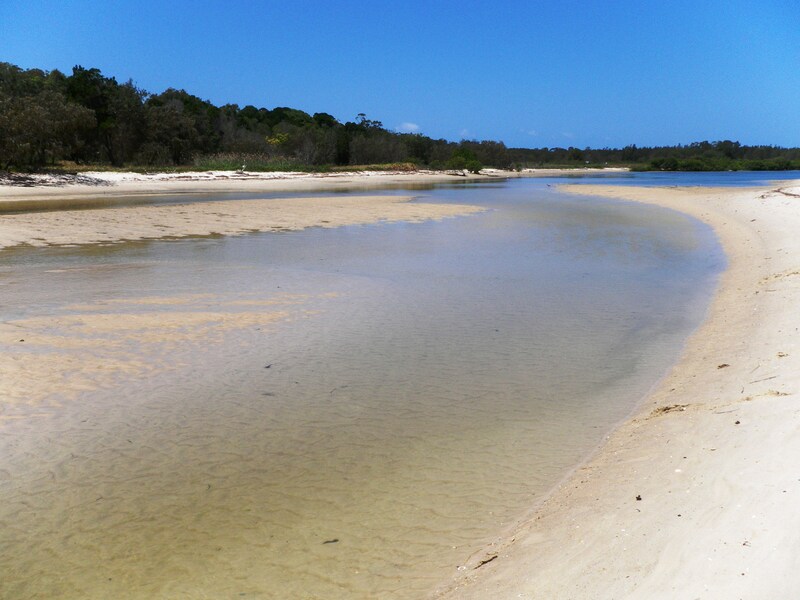 At the south edge of each of these bays is a long sand lip. This was where the fish were loitering, in less than 25cm of water. I decided to change to a bigger soft plastic and chose the GULP Crazylegs Jerkshad in the New Penny colour, still on a 1/8th 1/0 jighead. 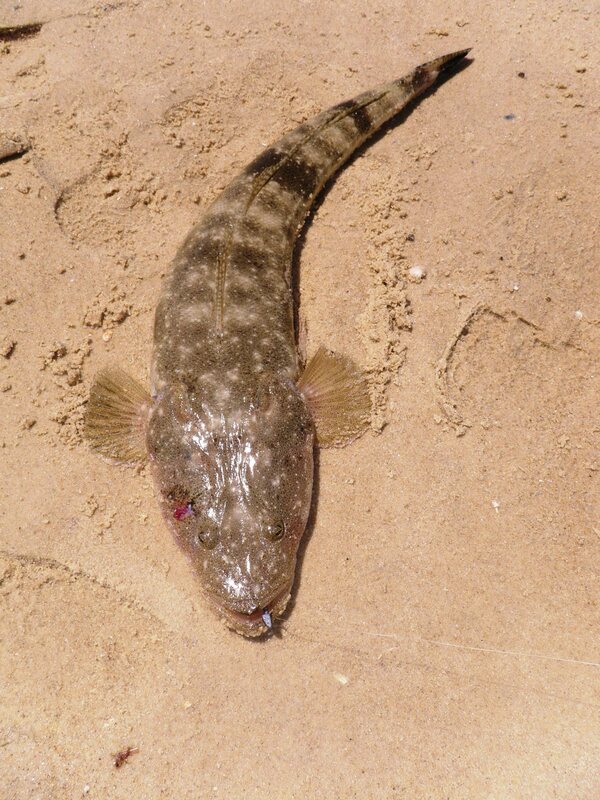 Just short of the next sand lip I disturbed a good-sized Flathead. Then, with the next cast, I felt a solid – thud, as I pulled the lure back to within a few metres of my feet. There was a big swirl and line started peeling. The fish started to swim north, against the current, which meant it got tired quite quickly. I kept the rod tip high and the pressure on. I could see it was a reasonable size and realized in the shallow water it might surface and start shaking its head, so I loosened the drag a little. It made a couple more runs. As I pulled it closer to the beach, I tightened the drag back up a bit and in one long, gentle sweep I pulled it clear of the water. It was a 66cm Flathead. It was just after 11.00 am and I had been fishing since 4.30 am, it had been a long morning and I had covered plenty of ground but it had paid off! 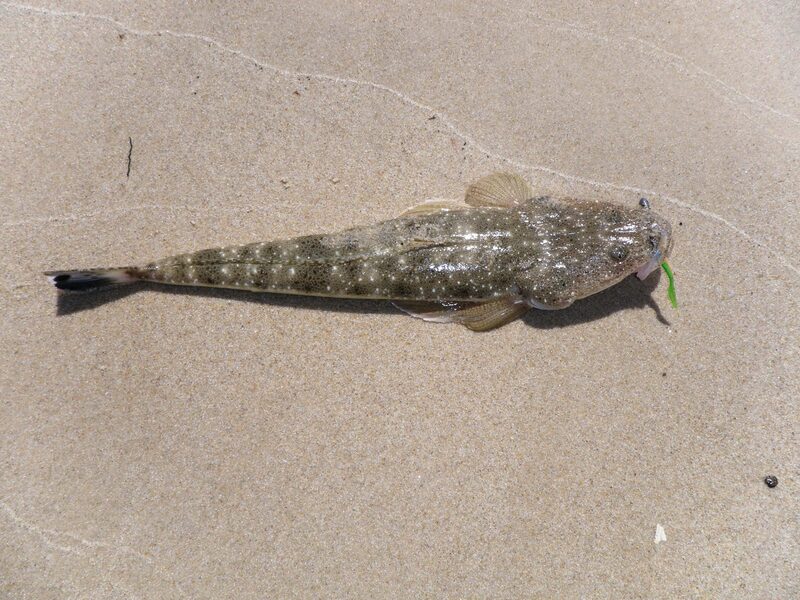 This entry was posted in Bribie Island, Fishing Reports and tagged 66cm Flathead, fishing at Bribie Island, fishing for Flathead with soft plastics, fishing Gulp soft plastics, land-based fishing at Bribie Island, New Penny. Bookmark the permalink. I love reading your stuff as I live in Beachmere. 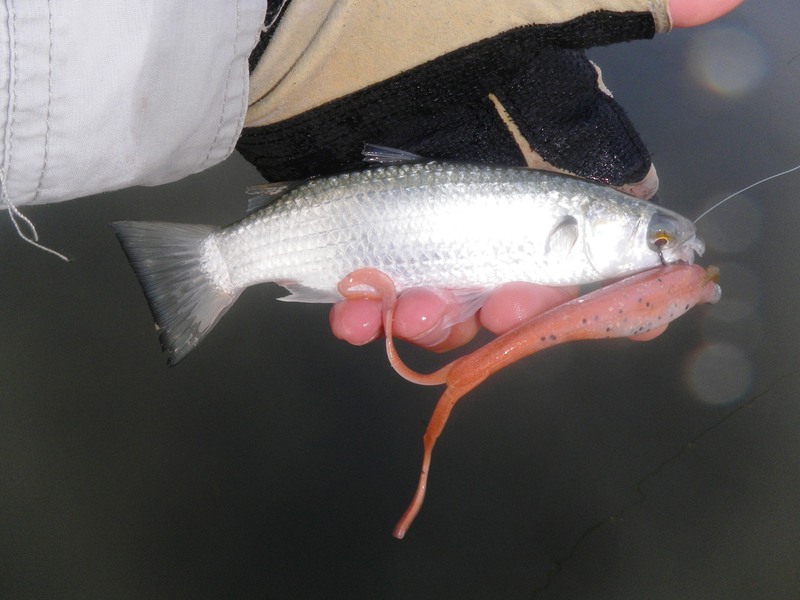 I was wondering –since I’m only a novice — if you have any thoughts on squid fishing and catching in the area? I do see squid from time to time, usually under the Bribie Bridge lights, just before dawn. They readliy attack the soft plastics but you can rarely hook them with a jighead. They seem to like the rubble bottom more than the sand flats. Because they only show up once in a while I have not really tried catching them.